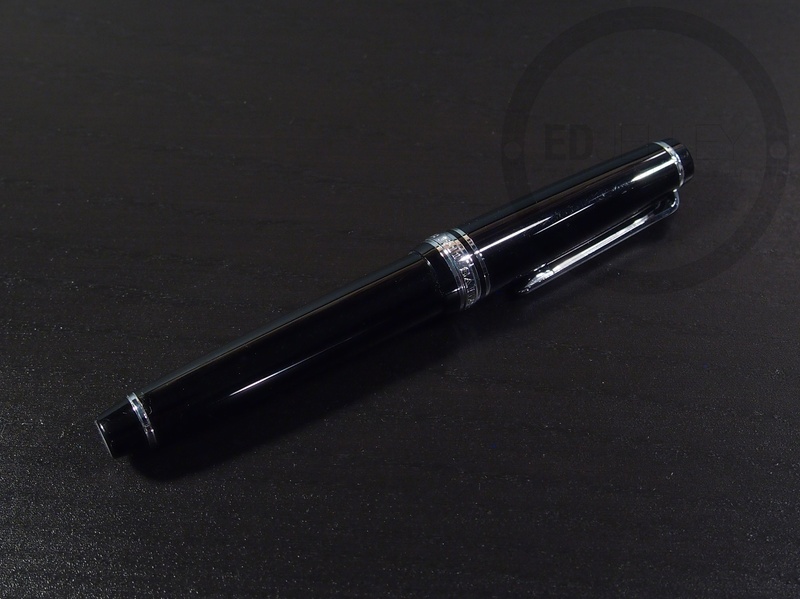 Description: One of the smaller offerings from Sailor, but posted this pen is quite comfortable. Classic looks and styling paired with an awesome nib make this pen one of my new daily carries. I picked up this pen from the Fountain Pen Network Classifieds for a great price. It’s my second Sailor, this time in an extra fine nib. At first, I thought the EF was going to be too fine for my liking, but I’m enjoying it a lot more than I thought I would. It’s been my go-to pocket pen since it’s arrived. Since I purchased it for only $55, I don’t mind if it gets bumped around a bit. The pen was already “pre-loved” when I received it, so apologies for the scratches in the pictures. I tried by best to polish them out, but maybe this is a good thing. If you throw your shiny resin Sailor into your pocket or bag, watch out because it will get scratched up. Anyway, onto the review. This pen is really, really great. Packaging is going to be left out of this review. Why? Because my packaging for this pen was a plastic bag, some bubble wrap, newspaper, and a Canada post shipping box. A quick Google shows that the pen comes in the standard Sailor pen box with a few cartridges and a converter. The box is high quality than a throwaway, but it’s nothing unique or exciting. The Sapporo is definitely on the smaller side of the spectrum when dealing in modern fountain pens. If you wish to include vintage, then this pen lies right about in the middle. It’s pretty close in size to the TWSBI mini – when capped or posted. The Sailor Sapporo is right at home in a pocket where it takes up minimal room. When unposted, the pen is a bit too small to comfortably write with for me, but when posted it’s perfect. The pen is on the lighter side and it’s very well balanced. Only the lightest touch is required to lay ink down on the page, even from this extra fine Japanese nib. My Sapporo is the black resin model with rhodium (silver) trim. 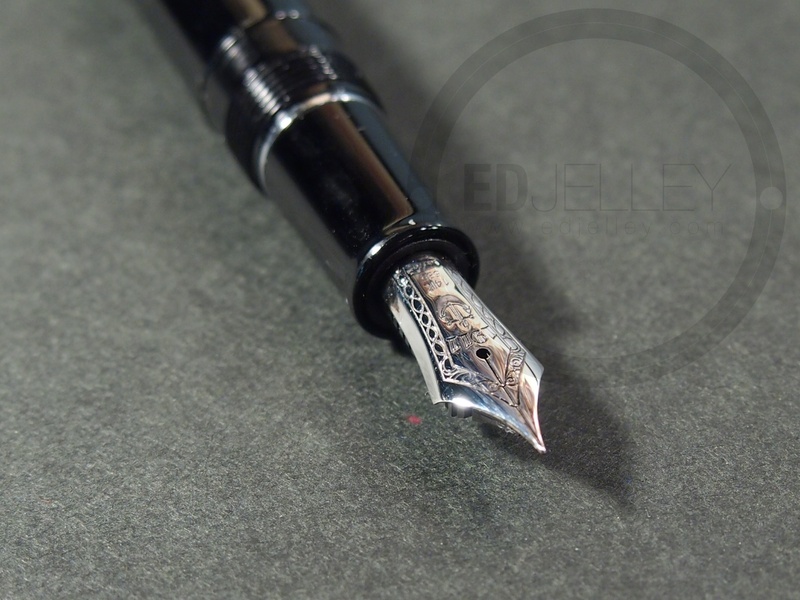 It’s a classic looking fountain pen with all of the details that are to be expected on a larger and more expensive pen. There’s a double cap band with engraving, a stamped gold nib with beautiful detail work, metal internal threads inside the body, and much more. It’s a great looking and performing pen in a highly portable package. For a pen that lays down such an incredibly fine line, it’s very smooth. There is a bit of feedback from the nib, but this is to be expected from something that writes a 0.2mm-0.3mm line. The nib puts ink on the page with no hesitation and minimal pressure. 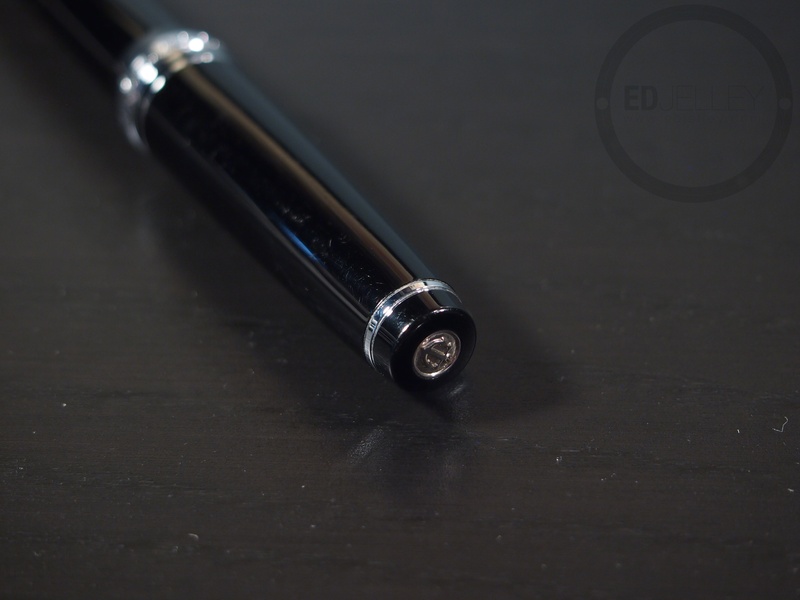 You can now count be in as part of the super fine Japanese nib fanclub (most likely headed by Mr. Brad Dowdy at PenAddict.com). I really really like how the nib looks too. The stamp / engraving on the nib is some of my favorite out there. I love the anchor and the scroll work. From the second I saw a Sailor nib, I knew I needed one in my collection (now I have two…). 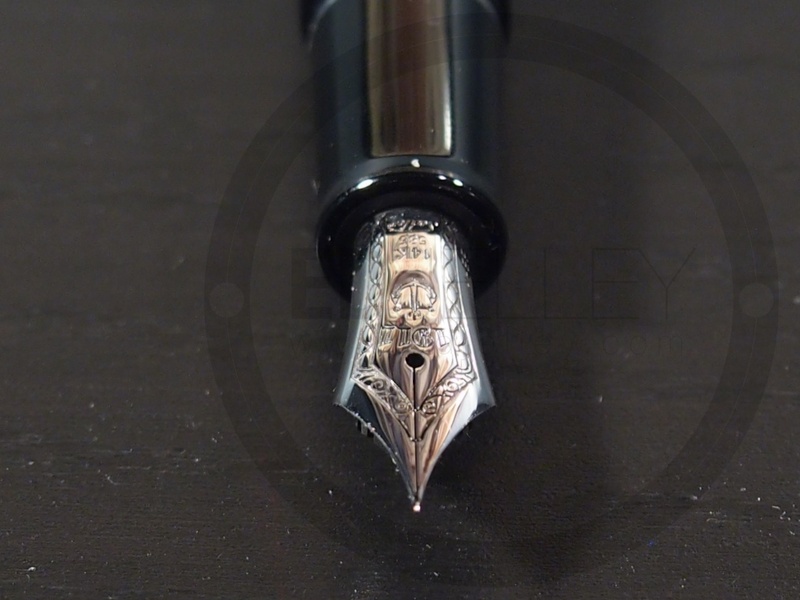 If you’re looking for an extra fine nib that writes well, look no further. Also worth pointing out is that this pen/ink combo is my standard for writing in Field Notes. 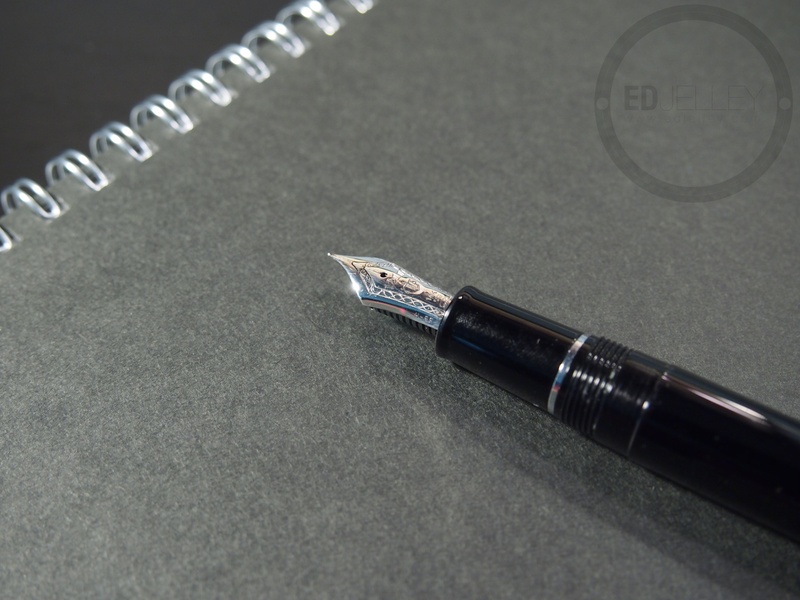 While they’re not always fountain pen friendly, the extra fine nib and the pigmented ink don’t bleed through the page and dry quickly without feathering. The ink also tends to last forever due to the thin line requiring minimal ink to write. The filling system in the Sailor Sapporo is a standard cartridge/converter system. There’s nothing new or exciting about the system, but it works. It doesn’t really bother me how the pen fills, and I don’t mind that there’s no piston. I tend to change inks frequently, so the smaller capacity in the converter is actually welcome in most situations. 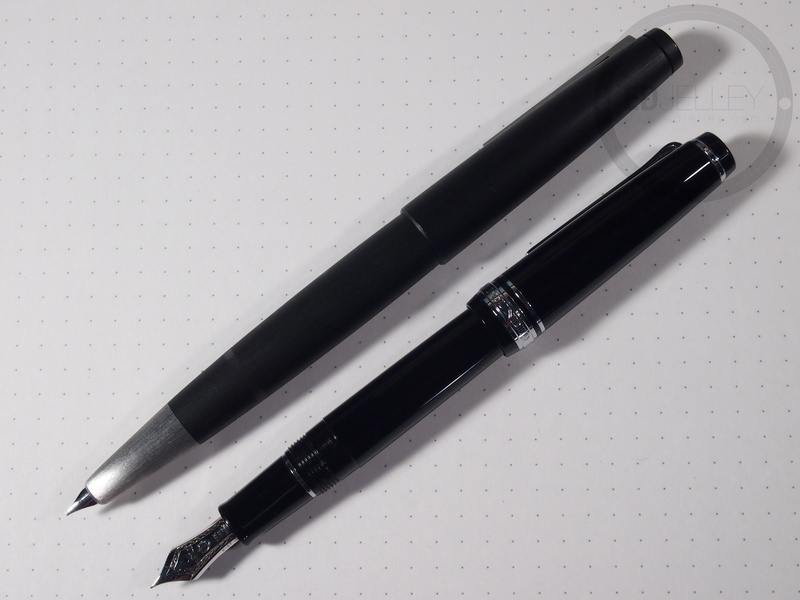 The EF nib has great “gas mileage” and a full converter lasted around two weeks. Many modern Japanese fountain pens use the cartridge/converter system, but Sailor does offer a Realo model of the 1911 that is a piston fill. It definitely tacks on a decent chunk of money to the price, and I feel that the ink window detracts from the way the pen looks. I touched on this a bit before, the Sailor Sapporo is a pretty small pen. It’s on the lighter side but it is very well balanced. While I don’t have one to compare it to, it’s almost identical in specs to the TWSBI mini. It’s a few millimeters longer than a Pilot Vanishing Point (with nib extended) and pretty close in size to a Parker Sonnet Cisele (both pens posted). 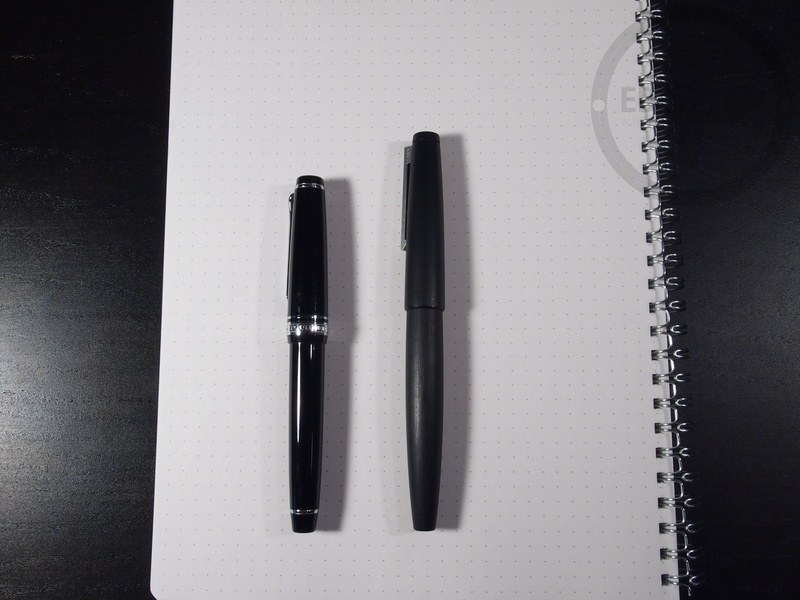 I decided to show the pen next to a Lamy 2000. It’s a fair bit smaller when capped, but when posted they’re quite comparable. The larger exposed nib on the Sailor makes the pen feel larger than it is. The grip on the Sapporo is comfortable with a slight flare before the nib. The diameter is comfortable in my medium sized hands (check the Kaweco Sport review for reference) and extended writing is no problem. I got through the handwritten review in one sitting with no problems. 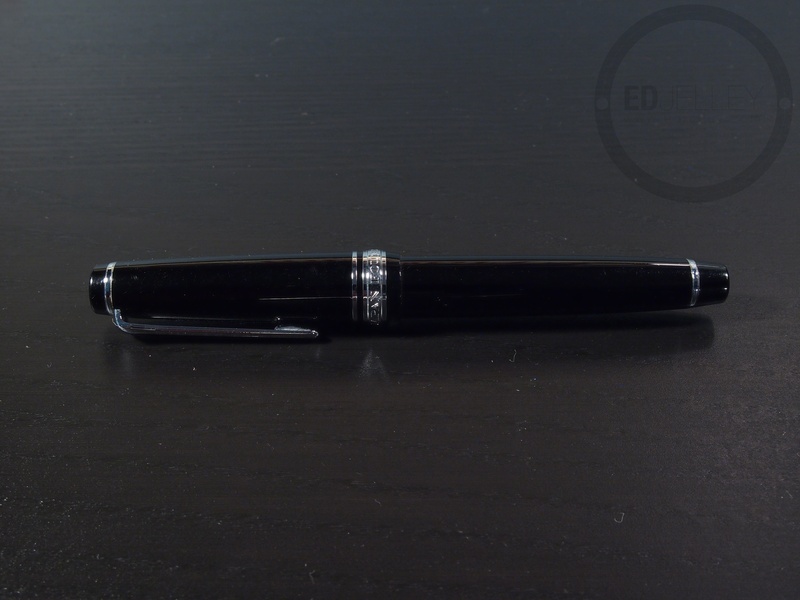 The pen is well suited for a pocket carry, but it comfortable enough to be a full time pen. Writing without posting the pen is a bit uncomfortable for me, so take note if you do not like to write with the cap posted. If you plan on using just the pen and putting the cap aside, you’ve been warned, it’s just a hair over 3.5″. I’m really, really enjoying this pen. BUT, I don’t know if I’m biased because I only paid $55 USD for it. This may be part of the reason why I like it so much. At around $155 new, this is no impulse purchase. There are many other pens in the price range, including the Lamy 2000, the Pilot Vanishing Point, and many more. It’s definitely getting into the higher end pen price range. It’s really hard for me to recommend this pen over the Lamy 2000, but some people will prefer it. It’s a solid performer that I’ve been carrying every day (about a month straight at the time of writing) since I’ve received the pen. Here’s my advice: If you can find one second hand at a reasonable price, 100% pick it up, you won’t be disappointed. 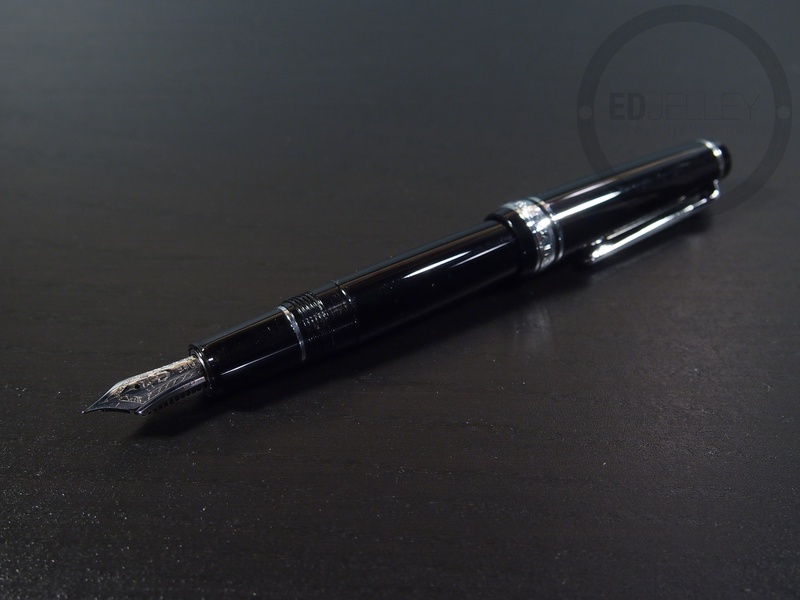 Make sure to check the Japanese direct retailers (engeika.com, kendo_karate on eBay, ratuken.com) because they usually have better prices on these pens straight from their country of origin. There are tons of options in the $150 price range, and this may not be my first choice, but it certainly isn’t a bad one by any means. Recommendation: Second hand – absolutely. Brand new at $155 – do your shopping carefully! If you liked the Sailor EF, then one day you should try the Saibi Togi, that nib is sooo fine and sharp you can tattoo ppl with it 🙂 yet it’s not as scratchy as one might expect. I’ve seen that nib before, I don’t know how much finer I could go honestly. I would definitely like to try one though!  Excellent review Ed, thanks for sharing your thoughts. I’ve not actually seen this one yet 3.5″ open does seem rather small your right, it will be interesting to feel just how small it is. Thanks! It’s definitely small, but posted it’s comfortable. Great review! I also picked one up from engeika for a good price and really enjoy writing with it. It definitely makes me want another Sailor. Yeah Engeika has these for $109 and there’s even a “Mini” version too. But good luck getting it shipped from Engeika – I’m in the middle of a shipping debacle with them right now. Yikes. It’s definitely a bit riskier ordering from out of country, but that price difference can definitely be tempting. I have this very same pen and I love it. Great to see it reviewed. Thanks! I’m loving it, especially for the price I paid. I discovered your site just today. Thank you so much for this review! I’m in the process of editing a post on Sailor fountain pens on my blog. The Sapporo is one of my favourites. I always carry two in my shirt pocket and I do in fact recommend the Sapporo, (or Professional Gear Slim), with H-M nib, as a first serious fountain pen. Glad you enjoyed it! I’m enjoying the Sapporo quite a bit, but like I mentioned in the review, I don’t know if I’d take it over a Lamy 2000. I got mine used for a great price which probably makes me slightly biased. Definitely not a bad recommendation and certainly a fine example of a high quality Japanese pen. Hi, I have the Sailor in the H-M nib and the Lamy 2000 in F, love both, but (as others have mentioned) the design of the Lamy makes it easy to rotate the pen off of its sweet spot, fwiw. Great review, thanks! It definitely does. Something about the tapered grip makes it really easy to rotate. My 2000 was adjusted by Richard Binder, and has a broader nib (it’s a medium). I think those two differences make it harder to lose the sweet spot.